ISRO’s sixth navigation satellite IRNSS-1F was successfully launched on Thursday onboard PSLV C32 from the spaceport in Sriharikota. 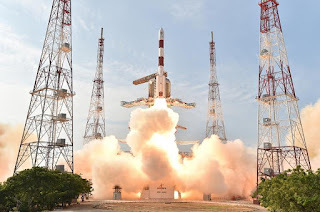 In a textbook mission, Indian Space Research Organisation’s workhorse PSLV-C32 lifted off from the Satish Dhawan Space Centre, Sriharikota, about 100 km from Chennai, at 4.01 PM and later injected the IRNSS-IF in sub-Geosynchronous Transfer Orbit (sub GTO). IRNSS-1F is the sixth in the series of seven satellites proposed under the Indian Regional Navigational Satellite System (IRNSS) that will offer navigational services on par with the US-based Global Positioning System. The first in this series was launched in July 2013. Prime Minister Shri Narendra Modi congratulated ISRO scientists on the successful launch of IRNSS1F into the orbit. "Successful launch of IRNSS-1F is an accomplishment we all take immense pride in. I salute the hardwork of our scientists & ISRO", the Prime Minister said.